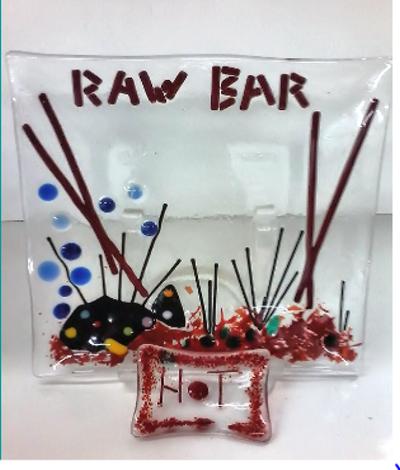 Each student will learn how to create their own fused glass Appetizer Dish or Sushi and dip dish. 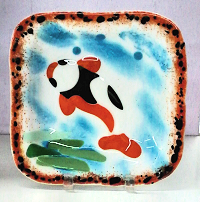 Beginner class for all ages including how to decorate and layer the art glass using stencils, stringers, repurposed glass, and frit to form a beautiful 8" Sushi /Appetizer plate with companion Wasabi or dip dish. Simple instructions helps all students create these plates by designing from their own imagination, with help as needed from instructor. No experience necessary for this 2 hour class. No cutting required. Pre-cut art glass, design elements and 2 firings included. (chopsticks not included). For more information or to register call 941 925 GLAS (4527). Create a round wavy bowl or square bowl that is perfect used for fruit, pasta, etc. These bowls are beautiful enough to display in your home or use as a functional art glass bowl. Using recycled glass, frit, powders, confetti, stringers, and noodles, design your glass in your own style. This class is appropriate for beginners or glass artists with some experience. Start with a round, clear or white glass disc and cap with color glass using design elements such as glass powders, frit, stringers, and noodles designing your platter to reflect your occasion. This class is appropriate for beginners as well as experienced fusers. 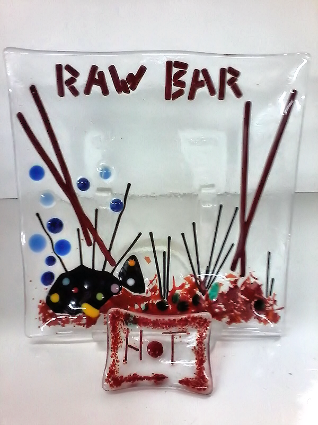 Instruction, glass for platter and pedestal, design elements, and fusing included. Create a fabulous, free form abstract fused glass coral bowl to display in your home as a functional or decorative art piece. Choose either regular or iridescent fused glass. Three bowl sizes available. Using strips of glass of your choice, design your bowl in your own style and color. 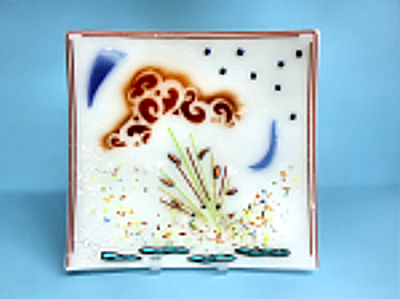 This latest, greatest fused glass bowl workshop is another class that sparks your imagination. This class will emphasize design by teaching you how to arrange your composition with many types of glass elements, while stimulating your creativity. Spark your imagination by placing these components on your base glass creating a design reflecting your personality and style. Beginner class for all ages including how to decorate and layer the art glass using stencils, stringers, repurposed glass, and frit to form a beautiful Sushi /Appetizer plate with companion Wasabi or dip dish.